Nintendo's glasses-free 3D portable gaming system will hit "across Europe" on March 25. The price will be set by retailers, Nintendo Europe says. The system, which hits the U.S. on Match 27 for $249.99, will come with a telescoping stylus and some digital software built in. Retailers, including Amazon and GameStop, list the price at €249.99. Nintendo first showed off the 3DS at last year's E3 video gaming expo in Los Angeles. The device, about the size of Nintendo's popular DS gaming system, allows people to watch movies and play games in 3D without the need of glasses. In addition to the directional pad found on the DS, the two-screen 3DS will also have an analog circle button, something more akin to what home console users may be used to. A built-in motion sensor and gyro sensor can react to the motion and tilt of the system, so whether players are twisting their systems side to side or moving them up and down, their motion-compatible Nintendo 3DS games respond instantly. The system will be backwards compatible with the DS and include some built-in DSi software. The device can also take 3D pictures and then display them on its screen, something becoming more relevant in a time when Sony is pushing 3D video and still cameras. The device will come in either Aqua Blue or Cosmo Black, Nintendo of America president Reggie Fils-Aime told a gathering of press this morning in New York. Seen in person, the handheld's 3D screen almost approaches magic in the way it can trick the eyes into seeing 3D images that either hover in front of the screen or drop away inside the screen. Games coming to the 3DS includes Pilotwings Resort, Nintendogs + Cats, submariner Steel Diver, Ocarina of Time 3D, Kid Icarus: Uprising, Dead or Alive Dimensions, Madden, Super Street Fighter IV 3D, Asphalt 3D, Combat of Giants Dinosaurs 3D, Lego Star Wars III The Clone Wars, Ridge Racer 3D, Resident Evil The Mercenaries 3D. Nintendo says they hope to have more than 30 games hit the Nintendo 3DS by June. 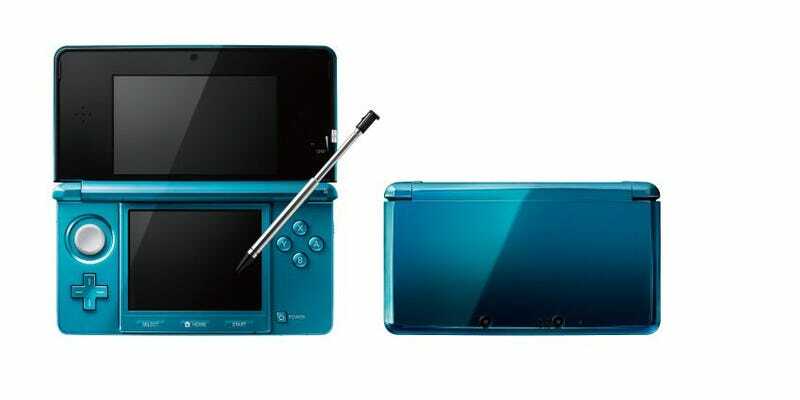 The 3DS will also have some built-in software including a pedometer that will track your physical movement and log it. Mii Maker will allow gamers to create personal avatars that look a bit like the ones found in the Wii. Face Raiders, another built-in game, is a shooting gallery sort of title that puts your face into the game. The 3DS will also come with software for manipulating sound and browsing the Internet. The system will also allow gamers to log into Nintendo's e-shop, which will include a "steady progression of Game Boy and Game Boy Color" hits along with new games. The store will also include demos and trailers for new games.